One of my biggest peeves is red-toned eyebrows. I have dark brown hair with reddish/orange tones in certain lighting, but even then, reddish brows look plain unnatural. I always prefer a cool, ashy brown or taupe. As it is, any color will appear warmer once applied to my warm-toned skin. 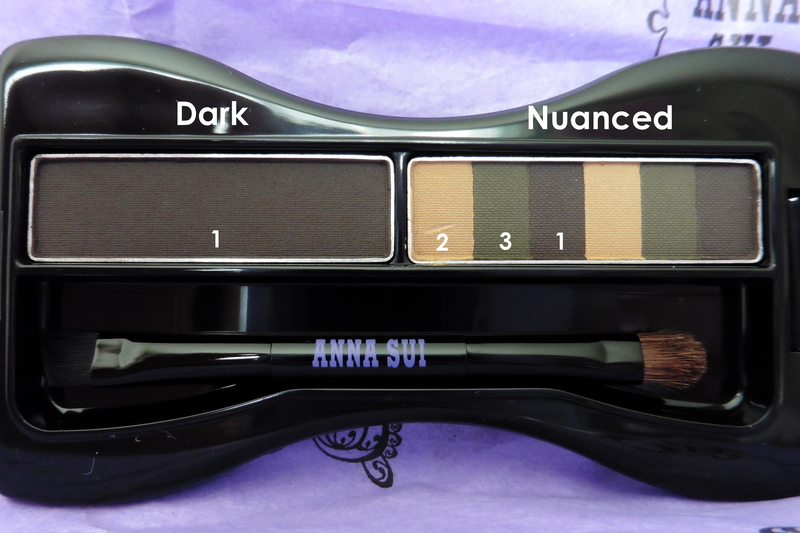 The Anna Sui Eyebrow Color Compact in 03 Ash Brown ($28) caught my eye because it includes a distinctive green shade. That’s right, green. I’ve been intrigued by the concept of green for brows since seeing green SUQQU brow products on various blogs, e.g., this liquid brow pen in Moss Green and the Blend Eyebrow palette featuring a green shade. 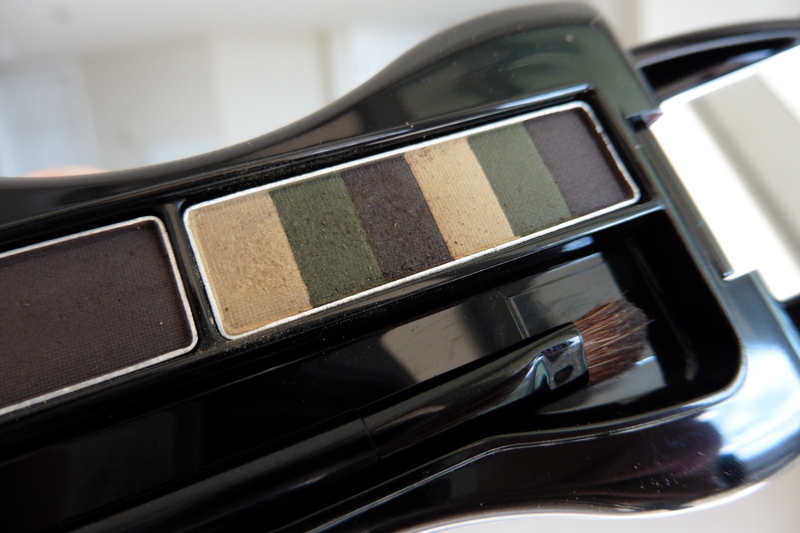 The idea is that the green will impart a cool tone to the brows. It doesn’t actually show up as green. 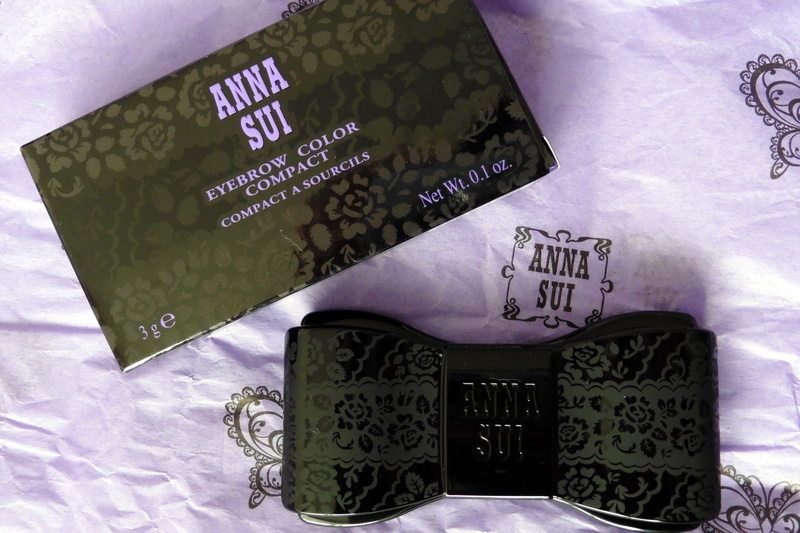 This eyebrow compact has the best packaging, which is to be expected from Anna Sui. It’s shaped like a bow and opens up to reveal a mirror on one side and the brow powders and a double-sided applicator on the other. The brow powders consist of the “Dark” side, featuring a cool deep brown (almost black), and a “Nuanced” side, featuring a light yellowy brown, dark mossy green, and the same deep brown from the Dark side. Interestingly, in the photos the green (#3) looks like a very cool, dark brown whereas it looked green in person. The deep brown (#1) almost looks like it has a tinge of purple in comparison. You can see that the Nuanced shades create a dark cool black-brown when blended together (1+2+3). 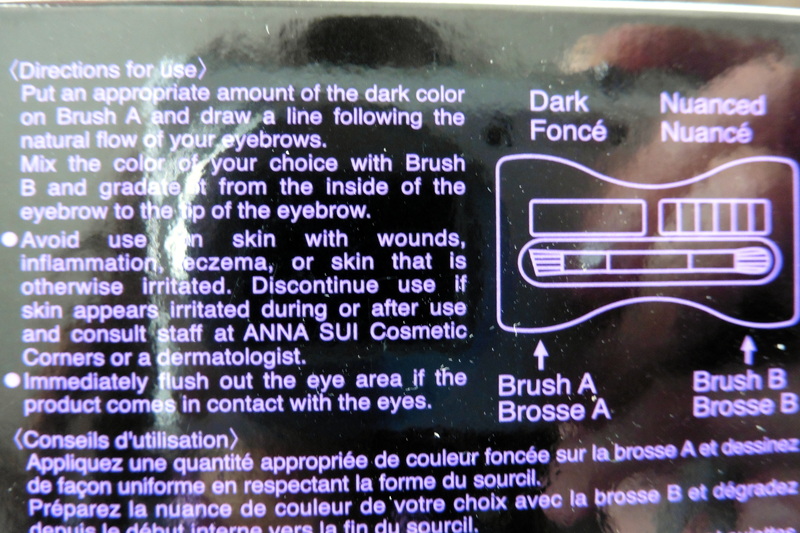 Instructions: Apply the Dark color with the angled side of the applicator. Apply a mix of the Nuanced colors with the fluffy side of the applicator, creating a gradient from light to dark from the inside of the eyebrow outwards. The powders are as pigmented as eye shadow. Unlike my other brow powders (Anastasia, Tarte, Revlon), it doesn’t take several passes to build up the color. At first, I thought that was a negative because I like being able to control the depth of my brow color. After several uses of the Anna Sui though, I think I’ve mastered the learning curve in picking up the right amount of powder with my brush. I still end up with quite dark brows, but now I also appreciate being able to do brows a lot quicker because I don’t need to build up the color. Also unlike my other brow powders, the texture is not hard-packed but rather powdery, which again contributes to how easy it is to overapply. Running the fluffy applicator over the Nuanced side kicks up bits of powder although it has become less powdery with each use. My first two uses, some of the powder clumped together, resulting in dark patches and flecks in the brows and and fallout around my eyes. This has also become less of an issue the more I’ve used it. Update July 2015: This powder became a reliable staple. 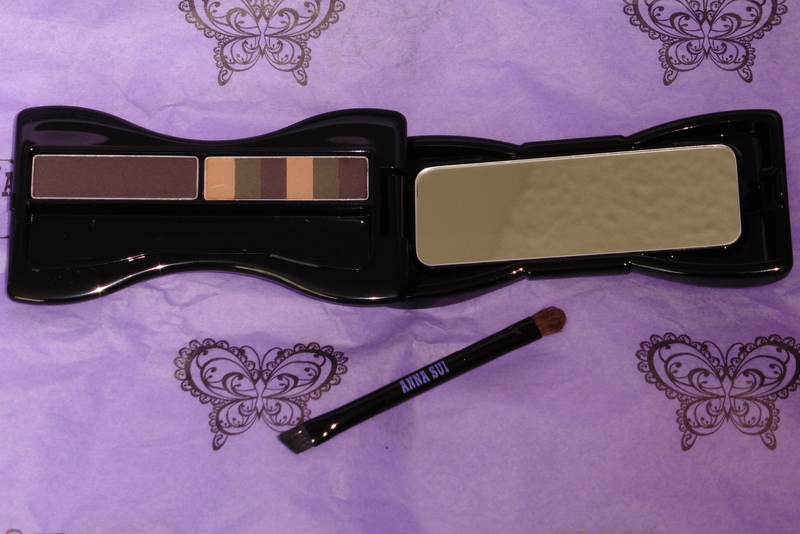 The powderiness soon went away and, with repeated use, I learned to do my brows quickly without making them too dark. I usually used both ends of the applicator, but I especially loved the fluffy end because it really made quick work of shading in my brows softly and evenly. I liked using the fluffy end to apply a blend of colors 2+3 to the inner half and a blend of 3+1 to the outer half, and then using the angled end to outline and sharpen my brow with the solid block of shade 1. And the compact packaging can’t be beat! I only wish there were a dark taupe version for lighter brows in the summer. Ultimately, the resulting color–a cool black-brown indoors and warmer and browner in bright lights–is not unique. But overall, I like this for a quick and darker brow. Pros: Pigmented, customizable shades. Lasts all day. Useful applicators and compact design. Cons: More powdery and pigmented than ordinary brow powders, which can result in fallout and patchiness and making it easy to overapply. P.S. Black-brown or taupe brows? 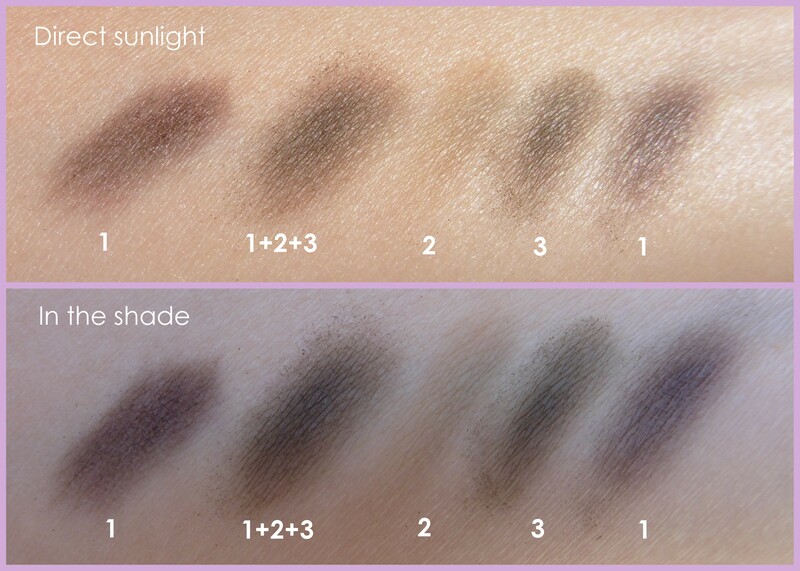 The black-brown side was done with the Anna Sui, and the taupe side was done with (discontinued) Anastasia and Revlon powders. Funny how they look similar when the flash is on. Yeah, I love how girly and romantic everything is.